What happens when America's favorite beagle turns up missing? Nothing short of a resounding cry from the entire "Peanuts" gang of Snoopy, Come Home. Legendary cartoonist, the late Charles M. Schulz, took his beloved comic strip characters onto the big screen in this dazzling display of colorful animation and delightful music. The fun-loving exploits of Charlie Brown, Snoopy, Linus, Lucy and the whole gang come to life in this story that will enchant the entire family. Accompanying Schulz's adorable characters and witty dialogue is a wondrous score by Richard and Robert Sherman. Their music is filled with upbeat songs that will keep you humming long after the picture is over. Snoopy, Come Home is sound, wholesome entertainment, as well as a hilarious treat for children and adults alike. After the success of 1969’s A Boy Named Charlie Brown, another theatrical Peanuts release became inevitable. The next flick arrived in 1972 with a feature that focused on Charlie Brown’s dog. That pooch stepped into the spotlight with Snoopy Come Home. In this flick, the independent-minded Snoopy (voiced by director Bill Melendez) gets a letter from a mysterious sick girl named Lila (Johana Baer). Snoopy immediately splits and takes his bird pal Woodstock with him. Snoopy’s abrupt departure puts Charlie Brown (Chad Webber) in a tizzy. 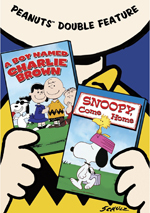 The rest of the movie looks at Snoopy’s connection with Lila and the choices he must make. Comparisons between Snoopy and Boy become inevitable. Truthfully, I prefer the earlier flick, though both have their merits. Actually, as a film, Snoopy probably works better, and it certainly presents a stronger plot. In Boy, I got the feeling Charles Schulz did little more than string together some old comic strips. The story lacked a coherent thrust and came across as a patchwork compilation. Though parts of Snoopy offer the same impression, it nonetheless seems much tighter and better integrated. It always concentrates on Snoopy. Even when he’s off-screen, the characters think of him and discuss him. Boy went off into many tangents, but Snoopy keeps its eyes on the main story. This means its many musical numbers flow more smoothly as well. I thought that Boy worked in a lot of tacked-on production pieces that didn’t mesh with the overall film. That doesn’t happen in Snoopy. While I don’t feel that the tunes of Disney songwriters Richard and Robert Sherman are particularly memorable, they advance the story and fit within the movie’s tale. Speaking of which, the plot sure has a lot more emotional heft than the story of Boy. Snoopy doesn’t turn into Terms of Endearment, but it goes into sadness more than one might expect. This means the movie packs a bigger punch and resonates more. As for negatives, I think Snoopy lacks the satirical bite and clever dialogue of Boy. This becomes inevitable due to its focus on Snoopy. He doesn’t talk, so his many scenes remain silent. The movie focuses on more slapstick than I’d like. Those segments are fine for what they offer, but I prefer when Peanuts showcases words instead of visuals. Actually, the decreased dialogue might not be so bad when I consider the voice actors. Most of the performers from Boy don’t reappear here, and the new cast isn’t as good as the prior one. Webber seems particularly lackluster, and Robin Kohn’s Lucy can’t approach the fussy snap of Pamelyn Ferdin’s. The actors aren’t bad, really, but they don’t do much with the material. Both flicks offer similarly mediocre animation. Neither Boy nor Snoopy does much to improve on the work you’d see in a Peanuts TV special. The animation is passable at best, though I admit this isn’t a terrible negative given the look of Charles Schulz’s drawings. I don’t think they’d make sense in a smoothly animated universe. All of that said, Snoopy Come Home remains a likable program. It offers a sweet, gently amusing film with a nice emotional bent. Kids will enjoy it and their parents might get into it as well. Snoopy Come Home appears in an aspect ratio of approximately 1.85:1 on this single-sided, single-layered DVD; the image has been enhanced for 16X9 televisions. After the weak visuals of A Boy Named Charlie Brown, the improved transfer of Snoopy came as a pleasant surprise. Sharpness only occasionally faltered. Some shots appeared slightly soft. However, those weren’t frequent intrusions, as most of the flick looked nicely delineated. No problems with jagged edges or shimmering popped up, and edge enhancement was minimal. Source flaws were a major distraction during Boy. Happily, they barely interfered with Snoopy. I still saw some specks and marks, and the image occasionally looked a bit grainy. Poor clean-up work often gave the movie a somewhat dirty look not related to the transfer. In any case, the end result was substantially cleaner than Boy, and print defects created few concerns. Colors also improved. They seemed somewhat dingy in Boy, and a few shots here were somewhat flat. Otherwise the tones appeared fairly lively. The hues were almost always good, and they sometimes became quite strong. Blacks seemed deep and firm, and the smattering of low-light shots looked smooth and easily visible. The transfer fell just short of “B+” levels, as it consistently satisfied. One oddity about the transfer: I don’t know if the 1.85:1 ratio represents the movie’s original dimensions. The opening and closing credits came windowboxed and looked to be 1.66:1. I didn’t think the film obviously appeared cropped on top and bottom, though the framing did occasionally seem a bit tight. However, if the movie wasn’t intended to be seen 1.66:1, why would it go to those dimensions for the credits? While perfectly acceptable, the Dolby Stereo 2.0 soundtrack of Snoopy Come Home wasn’t anything special. The soundfield opened up to a minor degree. Localized speech occasionally came from the sides, and effects decently accurately. A little movement occurred, but not much. Stereo imaging for the music was unexceptional. The score and songs spread to the sides without much real definition. I wouldn’t call it “broad mono” but I didn’t detect any particular clarity to the placement of the instruments. The surrounds acted to reinforce music and effects to a minor degree and that was it. Audio quality remained decent. Speech could be slightly flat, but the lines were consistently intelligible and lacked any edginess. Music also sometimes suffered from lackluster high-end, as the tunes and score seemed a little muted. Nonetheless, they were acceptable concise, and bass response was surprisingly good. Effects sounded more than acceptable, as they showed good clarity and passable depth. The soundtrack seemed fine for an older movie, but it wasn’t memorable. Indeed, it wasn’t even as good as the broader mix of A Boy Named Charlie Brown. How did the picture and sound of this Blu-Ray compare with those of the original 2006 DVD? Both were identical – literally. The 2011 DVD simply repackages the old one from 2006, so don’t expect any changes. Because of that, extras remain absent. We don’t even get basics like trailers. At least the movie itself remains winning. Snoopy Come Home has some flaws, but it overcomes those with a warm, moving little tale. The DVD provides surprisingly good picture with average audio. It omits any extras, but given its cheap retail price, it’s worth a purchase. Note that this release of Snoopy Come Home comes as part of a double-feature with 1972’s A Boy Named Charlie Brown. With a list price of $16.98, this is a great deal, especially since the movies originally retailed for $14.98 each.